This assembly of worksheets has been meticulously drafted to assist students of Grade 5 and above comprehend the use of place values where decimals are involved. Exercises here include a wide range of decimal place values up to millionths with a number of simple word problems thrown into the mix for variety! 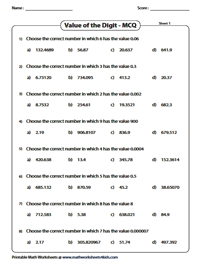 Select MCQ worksheets have also been included to test your child's understanding of decimal place values. Get young learners to identify the correct place values up to thousandths with this set of comprehensive resources. 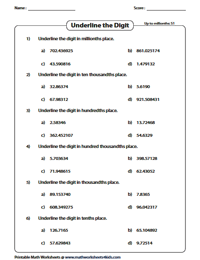 Underline the correct digit according to the given place value. 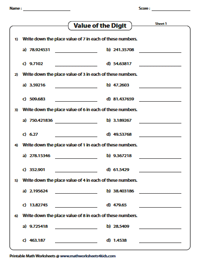 Download this entire set to gain ample practice in decimal place value. 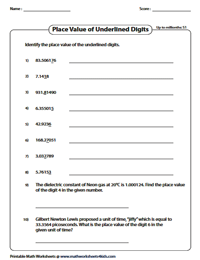 For the given set of decimals, identify and underline the digit according to the place value. Each question contains four decimals. The decimal numbers in these worksheets have place values up to millionths. Identify and write down the value of the underlined digit in word or numerical form. It includes place value up to thousandths. A few word problems have been thrown into the mix for variety! The decimals in this set of worksheets contain decimal parts up to millionths. 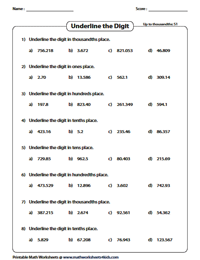 Represent the place value of the underlined digit in each decimal. Simple word problems based on place value are also featured here. This array of resourceful worksheets comprises six problems per page. Note down the place value for the particular digit specified in each question. Use the answer key to verify your responses. Practice this series of MCQs to gauge the ability of young learners in solving problems on place value. Apply your logical skills and choose the correct answer from the list of options. Identify the decimal that contains the digit with the specified place value. 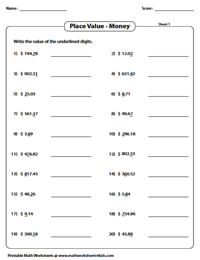 In these money worksheets, find the place value of the underlined digit in each decimal number (expressed in dollars). When the underlined digit holds tenths and hundredths, answers can also be written with a cent(¢) sign. 'Download all' for a unique learning experience.